Italian Emma Morano, the world’s oldest person, has died at the age of 117, reports say. She was born on November 29, 1899, in the Piedmont region of Italy. 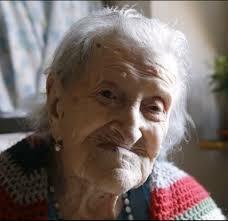 Emma Morano was officially the last person born in the 1800s still living. She had attributed her longevity to her genetics and a diet of three eggs a day, two of them raw. Emma Morano was the oldest of eight siblings, all of whom she has outlived. She died at her home in the northern city of Verbania. Her life not only spanned three centuries but also survived an abusive marriage, the loss of her only son, two World Wars and more than 90 Italian governments. Emma Morano had admitted that her longevity was partly down to genetics: her mother reached 91 and several sisters reached their centenary. However, it was also down to a rather unusual diet of three eggs – two raw – each day for more than 90 years. It was a regime she took up as a young woman, after the doctor diagnosed her with anemia shortly after World War One. She had cut down to just two eggs a day, and a few biscuits recently. Emma Morano’s doctor of 27 years, Carlo Bava, had told AFP that she rarely ate vegetables or fruit. Emma Morano also credited her longevity to her decision, in 1938, to kick out her husband – a year after her baby boy died at just six months old. The marriage had never been healthy, she said. She had been in love with a boy who was killed during World War One, and had no interest in marrying someone else. However, Emma Morano told La Stampa newspaper in an interview when she was a spritely 112 that she was left with little choice. Eventually, it became too much. Though they separated in 1938, they remained married until he died in 1978. Emma Morano, who worked until she was 75, chose never to marry again. “I didn’t want to be dominated by anyone,” she told the New York Times. Emma Morano had only taken on a full-time career a couple of years ago – but had not left her small two-room apartment for 20 years. According to the US-based Gerontology Research Group (GRG), the world’s oldest human being is now Jamaican Violet Brown, who was born on March 10, 1900.